What gets me excited? Partnerships. It's the collaboration and sharing, but the most energizing element of the partnership is the learning. This is a blog about partnerships in learning. The #NGSSchat PLN is excited about providing a forum to continue those K12 conversations around the research-grounded NGSS and Framework to improve science teaching and learning. We are also excited to launch a new series of grade-level specific chats during the hour leading up to #NGSSchat. Mary Starr @starrscience and Kathy Renfrew @KRScienceLady have launched and elementary NGSS chat #elNGSSchat . This chat focuses on K – 5 #NGSS discussions and takes place from 8 – 9 ET on the 1st and 3rd Thursday of the month prior to #NGSSchat. Grade-level chats for Middle School and High School educators and those that support them will begin on October 15 at 8:30 PM ET. These chats will last 30 minutes and take place on the 3rd Thursday of the month just before #NGSSchat. 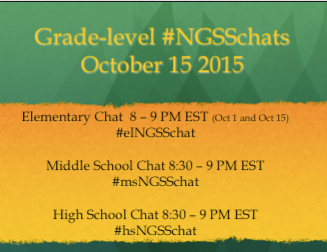 The Middle School chat will use the hashtag #msNGSSchat and the High School chat will use the hashtag #hsNGSSchat . These grade-level chats will provide opportunities for more specific and personalized discussions around the #NGSS as well as a rich network of support for implementation. An Invitation: Creat… on Go Big or Go Home!